Family businesses are significant worldwide, representing an influential network contributing to the world’s economy. The HKUST Business School is at the forefront of ethnic Chinese family business studies led by its Tanoto Center for Asian Family Business and Entrepreneurship Studies. 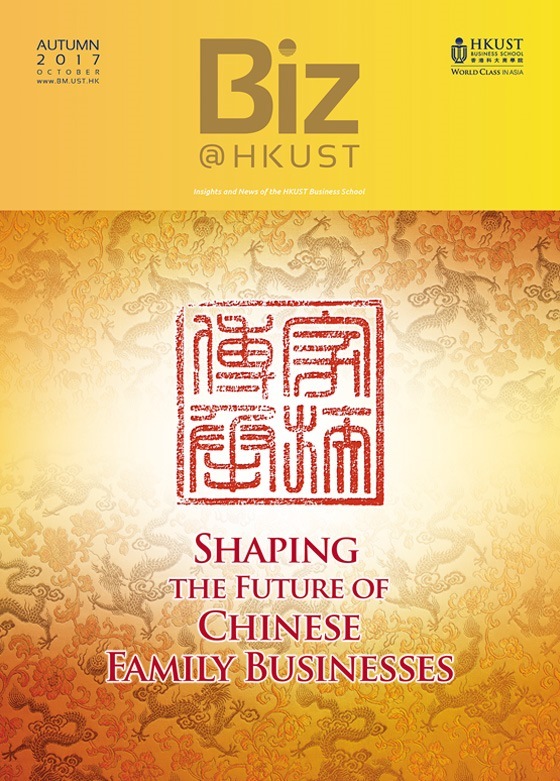 To share its latest insights and celebrate the renewed donation from the Tanoto Foundation to the Center, the School’s BizInsight@HKUST Series proudly presents a luncheon forum on “Shaping the Future of Chinese Family Businesses”. Professor Roger King, Founder and Director of the Tanoto Center, will speak on the future trend of Chinese family businesses from research. A dynamic group of next generation entrepreneurs – Mr Richie Eu of Eu Yan Sang, Ms. Nisa Leung of Qiming Venture Partners, and Mr Kevin Wong of Origami Labs and Kowloon Watch – will also join the event in a panel to discuss how Chinese families can best invest in their own future. Panel Discussion on "Investing in the Future: Nurturing Entrepreneurial Next Generation"
Our school magazine Biz@HKUST (Issue 55) covers highlights of this luncheon forum, together with a number of feature stories of leading family businesses.